I pulled into the car wash, waiting for the flashing red light to announce when I’d arrived at the appropriate spot to put the car in neutral. My windshield filled with squiggly lines of soap turning the glass before me into a colorful abstract painting. I closed my eyes and relaxed while the brushes outside whipped and turned, working to make my car look shiny and new. When finished, I pulled out of the car wash and turned on the wipers to clear the front window of the remaining water. That’s when I discovered my wipers had disappeared. I sat staring at the black stubs rocking back and forth at the bottom of the windshield, trying to figure out what happened. Parking the car by the office in the lot, I went inside to find a manager. Turns out, the owner was there sitting at his desk. No, I replied, it’s not raining out. Why would I have my wipers on? Wanting to be made whole. Uh-oh. Video in the tunnel? I started to feel like a jerk. This experience happened a month ago and it’s stayed with me. 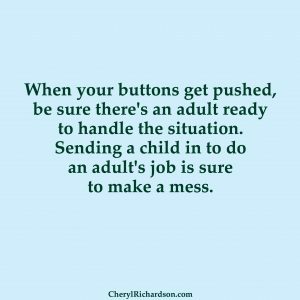 At my retreats and workshops I talk about how most of us walk through life in adult bodies with a child inside trying to run the show. Just look at the political circus currently going on in the USA for proof. This week’s video will make you laugh. You can watch it here. Thanks, Kelly!